“Kees combines high professional competencies, deep knowledge and very pleasant personal style.” ~ Dr. Katarina P.
“It has been a pleasure having had Kees with us. 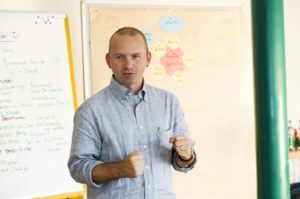 He showed great competence, understanding and sensitivity at the same time while supporting us in a quite complex re-organisational process.” ~ Sven R.
“I truly learned to appreciate his genuine, reflective approach to teaching, and his sincere, informed coaching support in times of complex challenges.” ~ Christopher D.
“Kees is a dedicated, inspiring, knowledgeable, experienced and insightful trainer, concerned with group dynamics as much as with individual processes.” ~ Naima G.
“Kees is a very dedicated and reliable trainer in the field of conflict transformation. I have always been impressed by his very high committment to his work.” ~ Stephan C.
“I can recommend Kees as a highly professional consultant with diplomatic skills and excellent overview amidst the hectics of deadlines.” ~ Anna S.
Mehr Empfehlungen auf meinem LinkedIn Profil.